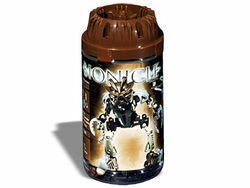 8568 Pohatu Nuva is a BIONICLE set released in 2002. Pohatu Nuva is one of the six Toa Nuva. He has armor covering his body and his shoulders and two Climbing Claws in his hands. Pohatu Nuva's colors are several shades of brown with silver armour. He wears the Kanohi Kakama Nuva, the Nuva Mask of Speed. In the BIONICLE universe, he is a Toa of Stone. His body is built very differently from the other Toa Nuva: instead of the gear moving the arms, the gear moves the legs, and his torso appears to be upside-down, giving him a stockier appearance. Pohatu Nuva's awesome might and blazing speed make him one of the most powerful of the Toa Nuva! His climbing claws help him scale any peak, and can be combined to form his legendary Kodan ball. Turn the wheel on his back to move his mighty arms. Facts about "8568 Pohatu Nuva"